Download the Android app now and play PokerStars anytime, anywhere. Our simple-to-use App and easy-to-follow download process means you could be playing online at PokerStars in a matter of minutes! 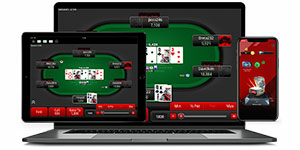 Plus, PokerStars is also available on Windows, Mac and iOS platforms. Press ‘Play Poker Now’ to start downloading the PokerStars Mobile app. This may take a few minutes, depending on your wireless or mobile data connection. Once the app has downloaded onto your device, press the PokerStars spade icon to launch our software. 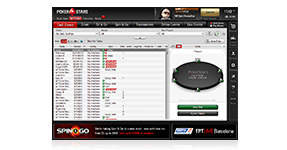 If you already have a PokerStars account, you can use your existing login details to access the tables. 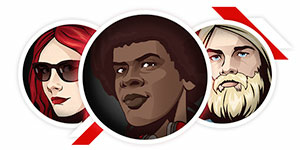 If you’re new to PokerStars, just follow the next few steps. To sign up for a new account, load the PokerStars software on your device and press ‘Login’, followed by ‘Need an Account?’. Fill in the registration form provided, making sure you enter a working email address in order to receive your validation code. Once you’ve received an email from PokerStars, press ‘Validate Email Address’ on the Mobile app and enter the full code sent to your chosen email address. Finally, press ‘Validate’ and you’re ready to start playing online. If you need assistance, just press the ‘Help’ button at any time. Finding games couldn’t be easier thanks to our specially designed Mobile tabs. Just press the ‘Lobby’ tab along the bottom of your screen once you’re logged in and fill out the search criteria to find your favourite games. You can switch between games by selecting the relevant tab at the top of your screen. If you know the specific Tournament ID of a poker event you want to play in, press the ‘Search’ icon and enter the relevant details into the search bar provided. More than 49M users are already signed up to the world's largest poker site, and now you can join them with Mobile Poker. With the biggest games, unrivalled VIP rewards and the chance to play in a range of different currencies and languages, PokerStars is the number one choice in online poker. Ring games and round-the-clock tournaments are starting right now in Hold'em and Omaha. Don't miss out! Unmissable big-money poker tournaments, like the World Championship of Online Poker (WCOOP) and Spring Championship of Online Poker (SCOOP), are only available on PokerStars and PokerStars Mobile. Add must-play weekly events like the $1,000,000 guaranteed Sunday Million and The Daily Bigs into the mix and our tournament schedule is second-to-none. PokerStars is behind some of the world's richest live poker tours, like PokerStars Championship and PokerStars Festival. You can win seats to these events and much more, including our annual tournament in The Bahamas - PokerStars Championship Bahamas - via value-added qualifiers and satellites online. Your online safety and security is our number one priority. Thanks to the best online software around, and a support team on call 24 hours a day, seven days a week, you won't find a better or safer online experience anywhere else. Our free-to-download software also comes with quick depositsand fast withdrawals as standard. So what are you waiting for? Download the PokerStars Mobile app now!